And, of course, there's tea. Mildred loves to host tea parties (by reservation only). A menu of options offers soup, salad, scones, finger sandwiches, pastries and an assortment of fragrant, delightful teas. The tea service is tailored to the guests' menu and time requests. 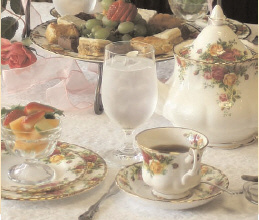 Most parties prefer the classic tiered tray presentation or the tea may be arranged in set courses. A cozy table of four is the typical group, but even large corporate groups may be served.